All 12 clubs are entered into the Bidmead Cup competition (see Rule 8.9). In the first round there are six matches drawn at random, home teams listed first. These should be completed by 4th March. The home team should offer two dates to their opponents. If home fixtures are difficult for any club then please arrange to switch venues (home team remains the same though) or use a neutral venue. IMPORTANT :- If a team only has two players divide the sum of the two handicaps by two to get the team handicap. These are the documents entries will require for the competition. To view and print PDF files you will require Adobe Reader. The Bidmead Cup is the DDTTA's club competition run on a handicap basis. Brian Bidmead was a founder member of the Didcot & District Table Tennis Association. He held every office on the committee except Chairman and played for BRSA. At the 1977 AGM BRSA decided that they would like to donate a cup in recognition of his services to the association. Mick Norris suggested a competition with rules such that all players would be eligible but leading players discouraged. To be achieved with an inter-club knockout on a handicap basis. Each club would nominate 5 or 6 players from which 3 would play in a match. 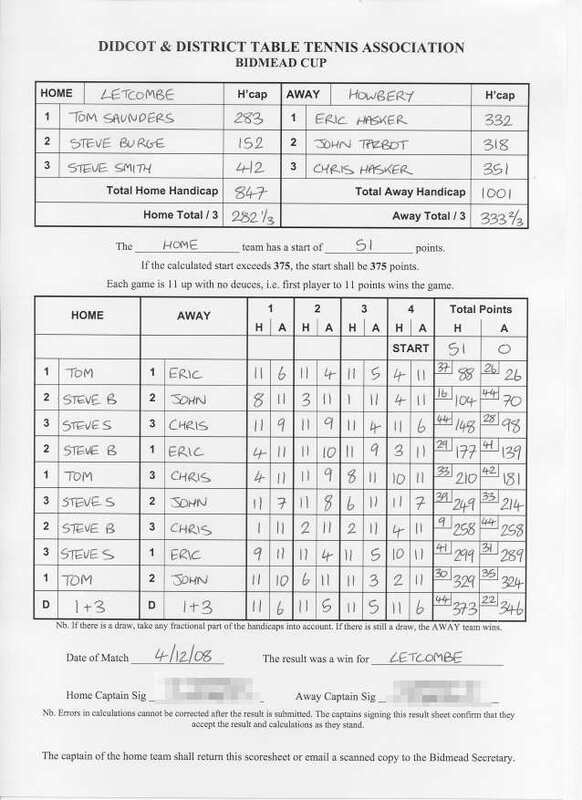 The first Bidmead competition was held in the 1977/78 season and was fittingly won by BRSA who beat Letcombe. Over the years the competition rules have altered several times, but it remains an interclub handicap competition. Brian Bidmead died in 1999 aged 69.